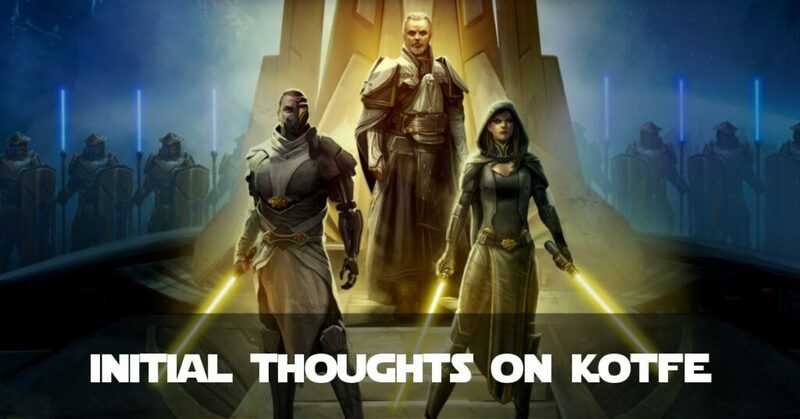 I have no doubt that many, many bloggers will be writing their thoughts on KotFE. In fact, you only have to browse Twitter for the #KotFE Hashtag to browse a range of ideas, views, some initial screenshots from SWTOR: Knights of the Fallen Empire. Some full-time bloggers have the luxury of recording videos and live streams. Sadly I don’t. But I do love this game so here are my initial thoughts. I have included screenshots which I hope will not be spoilers. BioWare promised a return to cinematic storytelling and they were not wrong. From the outset you are drawn into a movie-like experience with a balance between action and cinema. As someone who uses gaming for Fibromyalgia, this gives my hands and muscles a chance to relax. I find this combination pretty awesome to be honest. You really are immersed into the world and everything going on around it. The action is fast-paced in the initial chapters with both battles (finely balanced with level sync of course!) and the cutscenes, really pulling you into the middle of the action. I found it really hard to turn off even for having to sleep before work! Up until the release of this expansion pack (or entire game-rewrite more likely!) you only dealt on the surface with NPCs who were not your companions. Now you have regular in-depth reactions with other people in the world. Not only are you drawn in to your story, but your characters are drawn in to the stories of the NPCs too. Plenty to get your teeth into! When you say you offer cinematic storytelling, you set the bar high for the graphics. And from my point of view, they have easily reached that high standard. The worlds are beautiful and believable, your own characters seem better rendered and the NPCs are very detailed. Even the clothes look more realistic than ever. Some of the cutscenes look like shots out of a Hollywood action movie and you can be swept along in the same kind of way. I have to say at this point there’s plenty to impress me. There are some odd things which I’ll come to, but they are more ‘learning points’ than anything. 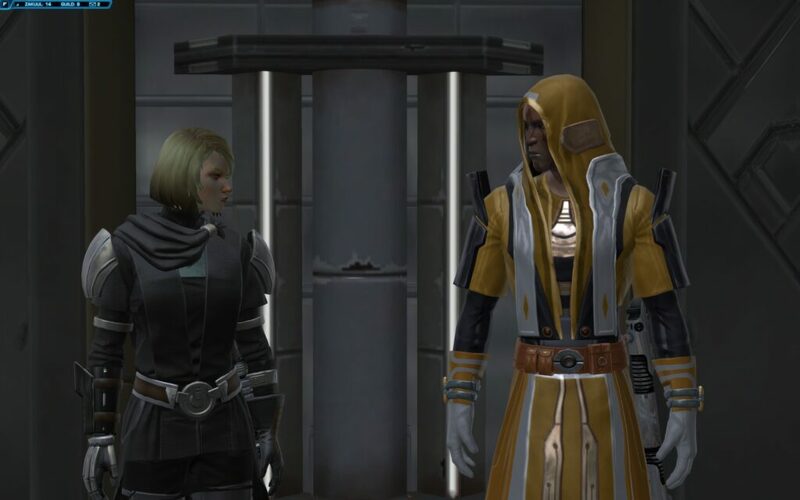 It’s no secret that Lana Beniko is in KotFE so I feel safe posting a screenshot of her and Cor-Jhan Arcturus before full-launch! You don’t know any more than your character about what’s to come. That’s healthy – the journey of discovery is shared. You don’t know what’s happened and you don’t know what’s to come. That’s great! NPCs Characters are more in-depth: people don’t just increase or decrease influence (what used to be ‘Companion Affection’) – their reactions are wider than that. This means you don’t always ‘get’ them. Secrets are kept and revealed and how you react to them influences how they interact with each other. I like that aspect very much. The Butterfly Effect: As with life there are real consequences (read: KOTFE: Power To You?) – but you don’t often know what they are. It’s not just about affection and Light/Dark Side any more, what you do can have repercussions a long way down the line. Disturbing statements like Your Decision Will Be Remembered leave the possibilities of consequences wide open! Onto more practical things now. I am really grateful to see the UI Customisation Grid! Getting items aligned better really sits well with me. I make websites as part of my job so I’m used to using Grid Systems. This new feature really helps with that. A few things have cropped up that I really haven’t grasped yet. Despite having put out details about Crafting in KoTFE, I feel like BioWare have made crafting more complicated. I’m actually considering setting up a new Level 1 character in order to learn crafting from the ground up! So when I looked at crafting a Relic, I now apparently need 10 Components from the Armstech crew skill (I’m an Artificer!). Totally confused! 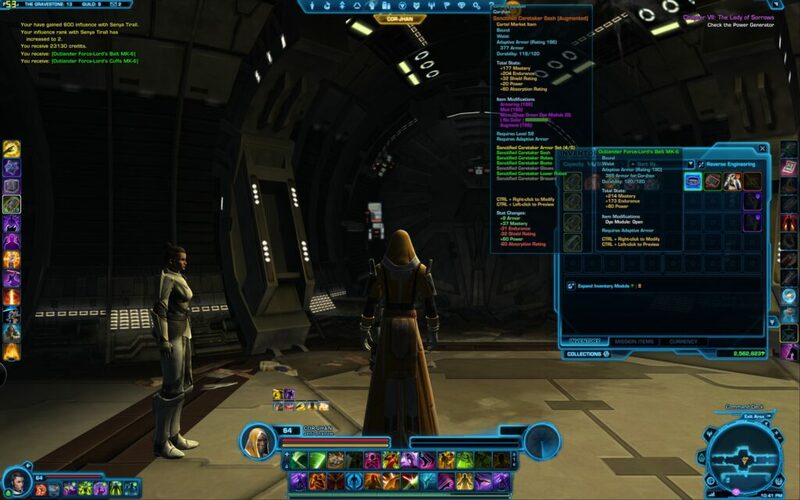 I had almost a complete set of 190 Rating gear before starting KotFE, but some of the mods I could purchase on Zakuul forced me to trade Mastery in order to gain Defence and Endurance. As a Tank Class Shadow Jedi I need Endurance and Defence, but would the trade-off be worth it? Hard to tell as battles take me long enough at my current DPS! The ‘hover’ details on my gear seem to list items which I haven’t worn in ages (Sanctified Caretaker set). I don’t know why. Anyone able to shed light on this? Loving it! I feel like I’m connecting with my characters on even a deeper level and seeking to understand them more. The story is very well written and the voice actors have done a great job. I look forward to playing this with different characters and taking different decisions and seeing how the world changes as a result. Yep, I pretty much had most of the same reactions you did. 😀 The story and the general quality of the cutscenes blew me away. Totally surpassed my expectations. I am REALLY looking forward to the additional chapters. hehe, thanks for your input Lorhin. Yeah I’m not a groupie really due to uncertainty and I find it a pressure (rightly or wrongly) but yeah I’m (pleasantly) surprised just how good comp DPS is since they removed the ability to customise ability sets. Had DPS on today – make a huge difference.